Ginebra beats Magnolia in record-setting "Clasico"
 Home  Barangay Ginebra San Miguel  basketball  Magnolia Hotshots  PBA  Ginebra beats Magnolia in record-setting "Clasico"
QUEZON CITY—As Japeth Aguilar and Rafi Reavis reached for the ball during the opening tip-off, LA Tenorio's legacy was already sealed. 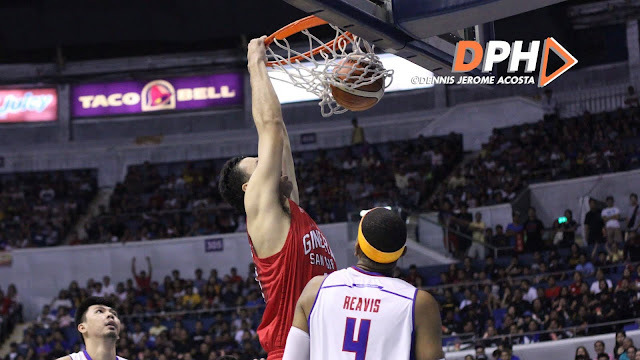 However, Scottie Thompson took the limelight and led Ginebra to a 97-93 overtime win against Magnolia in the first "Manila Clasico" for the 2019-2020 Philippine Basketball Association season at the Smart Araneta Coliseum on Sunday night. While Tenorio was relatively quiet in his 597th consecutive appearance, enough to take the PBA "Iron Man" title away from Alvin Patrimonio, Thompson took over for the Barangay as he sparked their 20-3 run that gave them a 33-18 lead, forcing Coach Chito Victolero to call three timeouts in succession. But come the second half, Jio Jalalon suddenly came alive as he led the Hotshots' comeback and capped it with back-to-back triples that eventually forced overtime. Mark Barroca, who blocked Sol Mercado's potential dagger that set up Jalalon's equalizing triple and stopped Tenorio getting a good look for the game-winner, scored on a triple early into overtime to put Magnolia ahead, 88-87. But Ginebra answered with a 9-2 run capped by Aguilar's slam to finally seal the win. Thompson put up 27 points, 11 rebounds, five assists, one steal, and one block for the Barangay, who moved up to 5-3, keeping their hopes of a Top 2 finish alive. Aguilar had his own double-double of 16 points and 12 rebounds with one assist, two blocks, and two steals. Tenorio finished with 10 points, five rebounds, and eight assists in 40:19 of play in his record-setting stint. Barroca put up 23 points, three rebounds, seven assists, five steals, and one block, while Jalalon added 22 markers, all in the second half and the overtime period, six rebounds, two assists, and three steals for the Hotshots, who fell to 3-5.